‘Tell you one thing—can’t beat the view’ (Matt Kowalski in ‘Gravity’). This latest critically-acclaimed film from Alfonso Cuarón comes as the culmination of a four years’ wait for technology to catch up with the director’s ideas, similarly to Cameron’s ‘Avatar’ (2009). In ‘Gravity’, we see mind-blowing visuals of the outer-space, beautiful shots of the planet Earth and exhilarating special effects. The film itself depicts two astronauts, Ryan Stone (Sandra Bullock) and Matt Kowalski (George Clooney) who are left stranded in the open space trying to get back to Earth while their supply of oxygen is running out. Meteors and flying debris are just examples of the dangers they have to face on their journey back. Even though virtually all of the film’s narrative takes place in the open space, ‘Gravity’ is packed with never-boring action, suspense, thrills, with occasional emotional moments thrown here and there to emphasise the inability of the mankind to compete with the forces of the universe. Cuarón captures the panic accurately and realistically on camera, from the heavy breathing to the screaming of his actors. The finale of the movie is also masterfully accomplished from the right music to the stunning scenery, and it is probably the most touching part of the film. 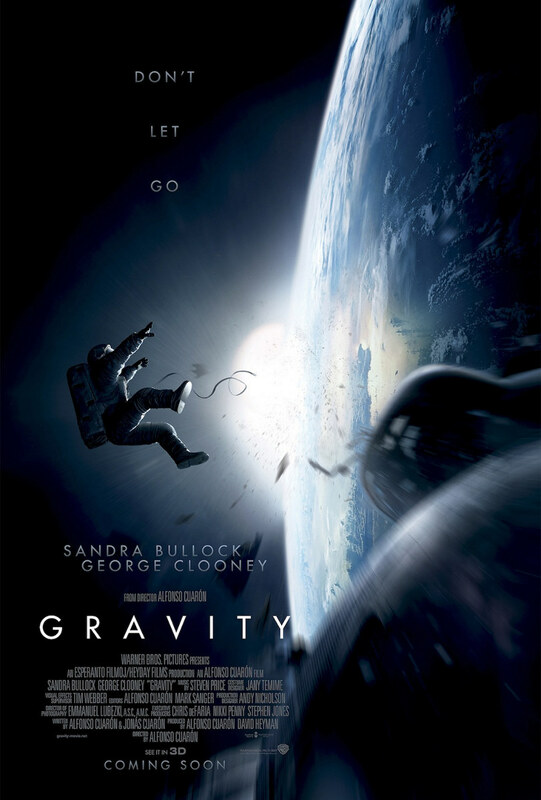 It seems that gravity really becomes almost a main character in the film, a force on which many things in the film depend. Taking the theme into account, the narrative cannot really be criticised. The story is a ceaseless roller-coaster ride from hope to despair and back again with not a moment left to contemplation. Clooney’s character, Matt Kowalski, repeats: ‘Houston, I have a bad feeling about this mission’, and, as Matt, the audience may also have a bad feeling about this film, i.e., that feeling that they may know how the film is about to end. However, unfortunately, although the film may think it is toying with its audience by constantly making them feel that something “bad” is about to happen every second of the movie, all these instances of “danger” in the film become only too frequent as the film progresses, making it more predictable that it should be. Alfonso Cuarón does an admiring job directing this challenging film. Although Cuarón had his ‘break-through’ with a drama ‘Y Tu Mama Tambien’ (2001), he is no stranger to the world of science-fiction, having previously directed ‘Harry Potter and the Prisoner of Azkaban’ (2004), which involved time-travel, and a science-fiction film ‘Children of Men’ (2006). Sandra Bullock has already shown she can act well, and her role in ‘The Blind Slide’ (2009) landed her an Oscar. However, while watching ‘Gravity’, it is impossible not to draw connections with her previous role in ‘Premonition’ (2007), an underrated, thought-provoking gem of a film in which Bullock faces some very stressful and horrific events. As in ‘Premonition’, Bullock here displays a very realistic reaction to stress, finding inner strength to combat her weaknesses and trying to make sense of the situation all on her own. It is easy to identify with Bullock’s character, and in that way, the audience should feel a tad grateful that Angelina Jolie, who was originally cast for the role, was unable to make it to the final cut. After Soderbergh’s ‘Solaris’ (2002), George Clooney should feel right at home in ‘Gravity’, but, in my opinion, Clooney (in the role of Matt Kowalski) is a huge (if not the main) problem in this film. In the words of one movie critic “Clooney plays things as if he’s still ‘Up in the Air’ [(2009)], delivering the “crammed-to-the-gills backpack” speech — way too cool for the dire circumstances” (Weber, E. Necn.com). This evaluation is spot-on. Although Clooney is funny and witty, he also makes ‘Gravity’ less believable, more fantastical, and, frankly, less moving. It is clear that the cast must have included some nice, ‘laid-back’, funny guy to offset the nervousness and tension of Ryan Stone (Bullock). However, Clooney hardly fits this profile, and virtually any other actor would have been a better choice. Hardly ‘nice’, Clooney, quite in spite of himself, still projects this image of haughtiness and cynicism, which does not fit ‘Gravity’ and its circumstances at all, and far from being ‘likeable’, Clooney’s character is quite annoying at times. This doubt about Clooney’s character makes some to respond quite neutrally to some scenes in the film, which should trigger some emotional response otherwise, and Bullock becomes the one who saves such scenes from a total disaster. This is especially so since Clooney is supposed to portray a real hero in the movie…Wait…Clooney? Really? Whoever is acquainted with his previous films, should feel, at the very least, sceptical to see him in this role, and even his forthcoming film ‘The Monuments Men’ (2014) is not enough to convince ourselves of the seriousness, unselfishness, and benevolence of Clooney’s film characters. But then again, the first choice for the role of Matt was Robert Downey Jr. (who was forced to drop out due to scheduling conflicts), and I should not really complain knowing the alternative. I think the movie has flaws, too. Though I have no particular issue with Cloony and I thought the plot competent enough to not be a weakness. It’s a very beautiful movie in terms of style and visual. However, when it came down to these characters actually talking, I couldn’t help but feel disappointed that not everything was so great. Good review. Many thanks. Yes, critics say the film is ‘faultless’, ‘perfect’, and I am glad to find out that not everyone thinks the same. Solid review and interesting take. I really haven’t forgotten the film. I watched it twice and desperately want to see it again. For me it was one of the most amazing experiences I had at the theater. Just love it. Nicely reviewed, although I’ll be honest it’s stayed with me since I saw it. I don’t agree with the part about Clooney, but with mostly everything else, I do. I didn’t even know Jolie was cast originally – and I really don’t know how to feel about that. Well, Bullock delivered it indeed, and I was very surprised at that – but maybe it’s because I haven’t seen Premonition. I think your review was spot on! I myself was not a fan of the film and would be far more critical, but i think you got it right. I am very confused as to why it is seen as such a great film. The effects are amazing and nothing can be taken away from that, but the storyline was unbelievable and Clooney seemed far too casual. Bullock was good, but in comparison to Tom Hanks in castaway the latter was far superior. I was miffed that it dominated both the Baftas and the Oscars. Thank you! And I think your comments are spot-on! diplomacy is great, but everyone is entitled to their opinion, so i tend not to be too diplomatic especially when a great film like 12 years a slave comes along and is beaten by cgi alone. I even felt the cinematography was far better on 12 years then on gravity. Agreed. But that’s not the world we are living in, unfortunately. People are becoming more and more technology-obsessed – which means ‘Gravity’ is the film of the year. Few people still really understand McQueen and his work, despite ’12 Years a Slave’. If we lived in a just world – McQueen’s ‘Shame’ (2011) would have won many awards, including Oscars. I am just relieved that ’12 Years a Slave’ got something. yes indeed!! Best film made up for it and Lupita being rewarded for a great performance.